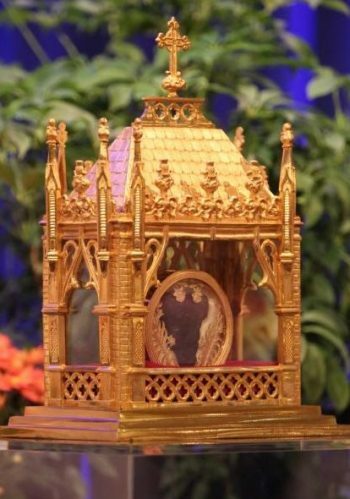 The incorrupt heart of St. John Vianney, patron of priests, will be received at the Cathedral Basilica of SS. Peter and Paul on Saturday, Feb. 2 and Sunday, Feb. 3. Vianney, who died in 1859, was a dedicated pastor in Ars, France who became known in particular as a confessor, often spending up to 16 hours a day listening to and absolving penitents. The relic’s reception in Philadelphia has been made possible through the generous support of the Knights of Columbus. All are invited to venerate the relic, and to pray for the healing of the Church, the transformation of the priesthood, and the sanctification of priests. 2 p.m. to 5 p.m. – Veneration of the relic until 5:00 p.m.
Veneration after Mass until 7:00 p.m.
7 a.m.to 6:15 p.m. – Veneration of the relic before and after Masses, which will be celebrated at 8 a.m., 9:30 a.m., 11 a.m., 12:30 p.m. and 6:30 p.m.